I enjoyed staying on this property very much and the unit was just right very well maintained. The pool decks were clean especially for the amount of use. How can you not love the view! We had a great time! We hope to return next year with our same group. It was our initial visit and it left a great impression. 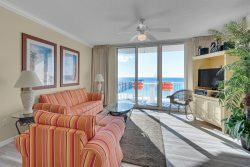 Beautifully appointed condo with all the amenities necessary to make for a wonderful vacation for a family ranging in age from 6 to 84! This was our fourth time staying in this unit and we'll definitely be back in the future. We have stayed in several other locations around the area but this is the most convenient and reasonable place to stay. We didn't really work or have much interaction with any team members, the ones we did talk to were all very nice. LOVED the beach chair guy, Juan! Never once had an issue. Everyone was very friendly and helpful. Loved this property. Will be back to stay soon!! Loved the property and its amenities. Great friendly staff...all of them!!! There was a possibility that we would be late checking in so, we called the staff. The staff were very friendly and knowledgeable. The staff gave us great instructions on what to do if we were late. Luckily we made it on time but the help we received was great. The room was beautiful, large, up to date and clean. We could not have asked for a better room. We were in the corner of the building and had a wrap around balcony that was very nice also. The team was very cordial and nice. They know what customer service is supposed to be like. The security guys were great! I Love the property. It has everything a family needs to have a great vacation. We can't wait to get back to visit Navarre again!